Drew McDowall is perhaps best known for his work with Coil, but you can't say that in recent years he has been inactive. Since leaving London and Coil for New York, Drew McDowall has been a regular fixture on the New York experimental and electronic scene, performing solo shows, remixing Long Distance Poison and Azar Swan and contributing to the soundtrack to Are You Okay a short film by Bret Easton Ellis for the Dum Dum Girls. Along with Kara Bohnenstiel he formed the short-lived Captain Sons and Daughters project but his post Coil work has largely been represented by the meditative drone and modular synth work with Tres Warren (Psychic Ills) as Compound Eye. 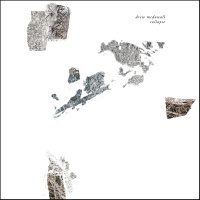 Some of Drew McDowall's work with Coil has recently been (re)issued by Cold Spring including Recoiled featuring Coil's remix work for Nine Inch Nails and Backwards, a belated release of their ill-fated and shelved recordings originally destined for Nine Inch Nails' Trent Reznor's Nothing Records. Drew McDowall spent 7 or so years as a member of Coil and Collapse continues the sensibility and approach he brought to Coil. But if anything from the Coil sound has seeped into Collapse it is particularly of the Coil side projects; the surreal warped sidereal sound of Black Light District and the tonal psychedelic shifts of Time Machines.Collapse is the first solo album from Drew McDowall, and with its abstract structure and textures it sure has been worth the wait. Collapse begins with a fantastic triptych under the intriguing title of 'The Chimeric Mesh Withdraws (Parts 1-3)'. Its opening austere electronic workings create cavernous layers more akin to dark ambient. It doesn't languish in the depths too long before disembodied and treated piano notes pass against the hiss of industrial hum, with movements of metallic screech and rays of skittering electronics. Despite the myriad of textural elements McDowall remains resolutely in control crafting mammoth blocks of abstract sound into electronic shudders, before allowing the wavering drones and electronic chatter, which comprise the second segment, to surface to create chiming alien melodies. From here hurtling phased voice effects transform into pulsating electronics, over faint melodic synth lines ebbing out in a vague throb sliced with black psychedelic nebulous tones. It's a brilliantly fascinating side long piece and throughout its 20 minute duration McDowall shows a remarkable sense of experimentation and restraint in its construction. Collapse quickly changes approach on the second side containing four shorter pieces. Whereas on 'The Chimeric Mesh Withdraws (Parts 1-3)' it is apparent that McDowall is the architect of the sound, on 'Hypnotic Congress' it almost seems as if he has yielded to the machines resulting in a cyclical flow of heaving textures and throbs, morphing into a heavily processed loop of chanting with voices as otherworldy as Sleazy's Threshold HouseBoys Choir. Within the confines of Collapse it rates as the most accessible and immediate sound form as a result of the stellar space groove of quickened metallic pulse and disintegrated loops, furnished by a distorted modular synth chime of sorts, which accompanies the alien chorus of manipulated voices. 'Through Is Out' foregoes the rhythmic cascade and cavernous blocks of abstract sound of the earlier tracks for gentle oscillations and whimpering processed violin strings, performed by pop-experimentalist Hiro Kone aka Nicky Mao. Shorn of the alien landscapes visited on the earlier tracks it belies a much warmer sound inhabiting the same sacred space that made Coil's Musick To Play In The Dark so reverential. The dizzying drone and pulse-like electronics carry an angelic atmospheric hum, which seems formed from layers of manipulated voices. It's hard to be sure, as everything on Collapse is subject to multiple treatments and reprocessing. But it is in the drone fixated end section where amidst the angelic conversation and waft of violin and electro pulses that you expect the spoken tones of John Balance to materialize. They don't though, and why should they, on this solo album from Drew McDowall. By the time we get to 'Convulse' the layers have been stripped back to reveal a human voice, in the form of a female voice toying with repetitious wordplay. In varying vocal inflections - and perhaps different voices - the words "I convulsed" are repeated over dull echoing thuds and stuttered fired rhythms with the occasional blast of muted wailing synths. It's perhaps the least engaging track on Collapse. At this point the entire recording of Collapse seem likes it has been a form of catharsis or rebirth moving from abstract thoughts through being lost in cyclical patterns to achieving a sense of recognition before the final track offers a sense of future possibility. It is however a path not fully realised, as drone patterns move into Kraut electronics which despite its obvious melodiousness are never given the opportunity to be given full flight.